Tonight it will be ten years since I first met her, and I've decided the time has come to tell our story. To reveal the incredible facts that we witnessed together; Yumi Ishiyama, Ulrich Stern, Odd Della Robbia, and myself, Jeremy Belpois. And Aelita, naturally. After the end of season 4 in 2007, many fans awaited a season 5 to answer all the questions left open... In 2009, long before the arrival of Code Lyoko Evolution, the official sequel to season 4 created by Moonscoop, other paths had been explored by the company. 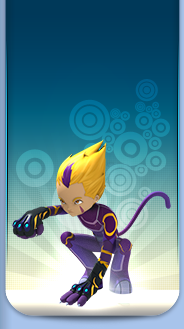 This collection of paths was called Code Lyoko Reloaded. Between all the projects, a continuation of the series in the form of a quadrilogy of four books was announced. The first to release them was an Italian publisher, Atlantyca, because the series was still being aired in Italy. These novels were announced under the name Code Lyoko Chronicles. They take place after season 4. This section summarises the content of the book series. The novels were published in Italian from mid-2009, with one novel released every 6 months. All four of them then arrived in Spain. None of the books were released in English. In France, it took until September 2010 for the first novel to be released, and March 2011 for the second. Unfortunately, after a commercial failure of the first two novels, books 3 and 4 were cancelled. However, for the French (3&4) and the English books, CodeLyoko.fr led a fan-translation project, so everybody can read the Chronicles. This project is named "Chronicle of a translation". The Chronicles are also available in Dutch (and also in Catalan, a language in Spain). The novels with their titles and dates in italics have never been "officially" released in their respective countries. They are, on the other hand, the objects of fan-translations under the authority of CodeLyoko.Fr. The titles are translations of the original Italian titles. The dates are when the translation for each novel was completed and made public. More than an opportunity to give an ending to the TV show, this literary quadrilogy is, among other things, intended to fill in the gaps and answer questions about the series' past, notably elements surrounding Franz Hopper's life. As we understand it: the story takes place a while after season 4. The action takes place in present day, with the heroes of our cartoon and a newly-brought-to-life XANA. 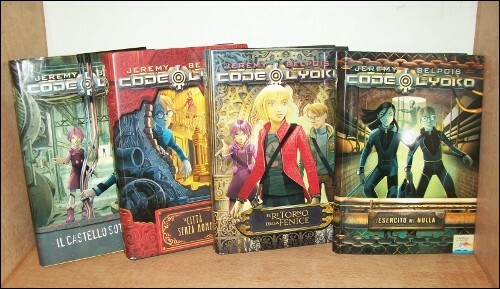 However, the objective of the books and their principal subject is truly to discover what happened before Code Lyoko. The heroes will therefore follow a whole journey that leads them to Franz Hopper's past...and the least we can say is that they will make many discoveries. However and paradoxically, in book 1 only, elements of Code Lyoko that we saw on TV, such as how the heroes met, are retold by the heroes (as flashbacks). They were slightly modified and simplified, doubtlessly to shorten the story a bit and allow people who haven't seen the show to still be able to read the books. Nonetheless, we have decided to separate the pages of the cartoon's story completely from the information in these next four pages. There is therefore no mention of what the Chronicles tell us on the backstory and prequel pages. There you go! Forewarned is forearmed! Follow the following pages to read the summary of the novels and learn many things about out heroes and the series' past. Code Lyoko Chronicles VS Code Lyoko Evolution? What is the value of the Chronicles' story compared to the series'? There was a time during which the Chronicles were the only existing continuation to the four-season animated series Code Lyoko. 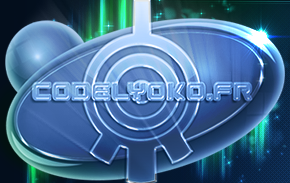 however, since the arrival of the novels, a new series has been produced: Code Lyoko Evolution. Although there are a number of differences between it and the animated series, it nonetheless remains presented as the official continuation. Canonically talking, the true continuation to Code Lyoko is well and truly Code Lyoko Evolution and its events. Nonetheless, we can note one thing: Evolution wants to be both a continuation but above all, a "new" series. It takes certain liberties with the scenario (notably the action which now takes place in 2013 and the disappearance of Hopper which changed from 1994 to 2003...). The new directors of the series therefore totally rewrote parts of Code Lyoko's Literary Bible and modified the concept to drive Evolution. The Chronicles, despite some shortcuts that were made in flashbacks to the events of the cartoon, remain much closer to Code Lyoko in terms of backstory. This hasn't been proven but it's very likely that the story was written taking the official documents of Code Lyoko (especially the Literary Bible) into account. The purists who deny Code Lyoko Evolution will find in the Chronicles a continuation that can prove to be more faithful to the original animated series... And in addition, a sequel that is much more complete in that it gives a concrete ending to our heroes' epic adventures and the story of Franz Hopper, an area which Evolution tends to avoid! Click on the picture to access the Download Section of the novels! This box will summarise some of the notable differences between the novels and the series. We won't reveal any spoilers, for example what happens to Aelita just before .... ###"""***___! On the other hand, we will reveal the blatant stuff. They won't ruin the intrigue but may surprise you. - The entirety of the fight the heroes led against XANA, strongly referenced throughout book one, was reinvented and made brief. You can find a detailed summary of it on the page for Book 1. - In terms of chronology, the Chronicles did a time jump during seasons 3 and 4. As such, Jeremy, Aelita, Odd and Ulrich are still 13 and in year 8. Yumi is 14 and in year 9. - Major, cataclysmic change: on Earth, Aelita and Anthea, her mother, have red hair instead of pink. This doesn't impact on the story itself. - Another conceptual change in the Earth locations, which influences events in the books: the Hermitage leads right onto Kadic's park and isn't separated by a wall and gate. - Jeremy's father is described as being blond with glasses, which isn't the case in the cartoon. - Finally, note that in the book, Jim is much more accessible. All the students at Kadic seem to refer to him informally (which is a bigger thing in French than English, mind).